"Ethics are about personal and professional values that influence development, identity, and decision making. Levitt, Moorhead, and their colleagues do a stellar job of highlighting the relationship between values and ethics in this well written and superbly edited volume filled with case studies, reflections, and analysis. This book is rich in resources and information. It is a must read for promoting ethical growth." "This casebook is an excellent values-based perspective on ethical decision-making. I appreciate the editors’ message that counselors’ personal values can contribute to counseling process, either positively or negatively. Stressed is the importance becoming aware of how personal values operate and the necessity of self-monitoring to avoid imposition their values on clients. A strength of the book is the diversity of the contributed case analyses and the discussion of these cases." "This book provides real, on-the-ground, ethical challenges. Ethical dilemmas rarely have one ‘correct’ outcome. The editors and contributors provide readers with encouragement to go beyond the text and apply their own critical thinking to potential ethical decisions and solutions." "Heller Levitt and Hartwig Moorhead have put together an exciting text that helps developing and seasoned counselors learn more about how personal values intersect with ethical decision making. 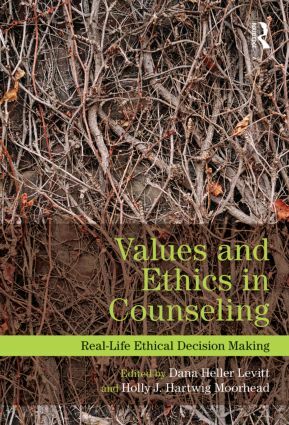 The unique casebook format points out the complexities of real-life ethical quandaries, provides insightful analysis, and prompts readers to get in touch with their own values-based responses to the cases—all of which make this book a must-have for counselors!" Dana Heller Levitt, PhD, is associate professor and graduate program coordinator for the counseling program at Montclair State University, USA, and has been a counselor educator for more than a decade. She is a past member of the American Counseling Association’s Ethics Committee and has served in several leadership roles. As part of her work with master’s and doctoral counseling students, Dana is an advocate for critical reflection in the ethical decision-making process and working in the best interests of populations that counselors serve. Holly J. Hartwig Moorhead, PhD, is a licensed counselor and an assistant professor of counseling at Regent University, USA. She has served as a member of both the American Counseling Association’s Ethics Committee and as the ethics officer for the National Board for Certified Counselors. As an outgrowth of her clinical work with students and supervisees and her experiences within professional counseling organizations, Holly is committed to helping professional counselors understand both the letter and spirit of ethical standards and make decisions that are sensitive and sound.